Now that I’m more than halfway through my courses for the EvMBA Program, I’m realizing how little time I have left to take advantage of the countless networking and educational opportunities that Goizueta offers. 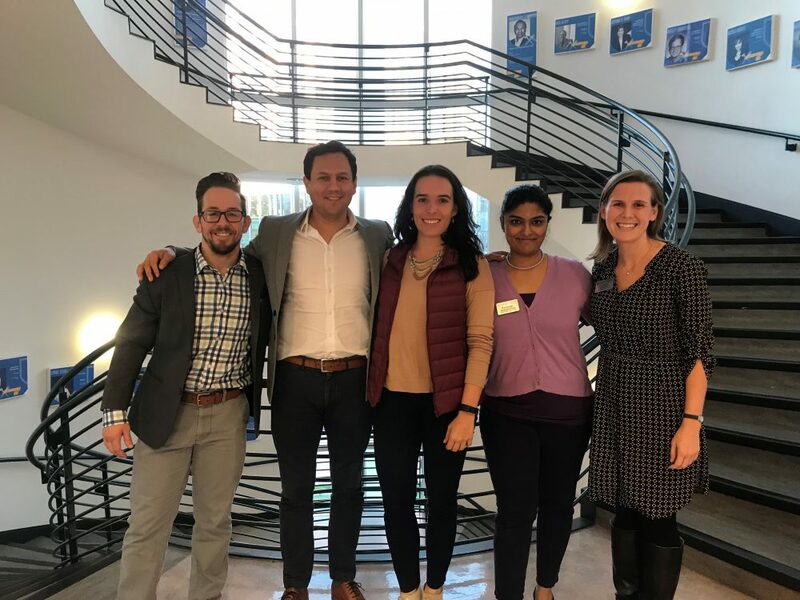 I’ve made it a goal this semester to “say yes” to as many opportunities that I can fit into my schedule — from serving as a Leadership Coaching Fellow, to attending office hours with Executives in Residence, to participating in the Leader’s Reaction Course, to attending lunches with Goizueta alumni, to being matched with an alumni mentor. Each of these experiences has offered professional development opportunities that supplement my classroom learning. While all of these experiences have broadened my network and challenged me to grow professionally, my favorite extracurricular experience this semester was participating in the Marriott Case Competition. A case competition is typically a day-long event where teams of students analyze a business challenge, devise an innovative solution and present that solution to a panel of judges. A few years back, Mitch Levine, Goizueta alum and founder of the Goizueta Hospitality & Tourism Club, started a Marriott Case Competition. This event takes place each fall and invites students from Goizueta Business School and Georgia Tech’s Scheller College of Business to tackle a hospitality-related business problem. When we first began the competition, my team discovered that none of us had ever worked in the hospitality industry. This lack of industry-specific experience left us feeling a tad overwhelmed — we were nervous that we would only be able to make surface-level recommendations while colleagues with experience in hospitality would have more interesting insights. We overcame that setback by relying on core problem solving frameworks and by leveraging our experiences as hotel guests to empathize with the customer experience. If you’ve ever felt nervous about transitioning into a new industry, then participating in a case competition is a great, low-stakes environment to explore something new. Case competitions typically require teams to analyze, innovate and present a solution in the course of only a few hours. This acceleration can put a lot of stress on a team, and sometimes the pressure leads team members to show not-so-glamorous aspects of their personality. It is difficult to show patience and teamwork under a fast-paced environment. Personally, I tend to become bossy under stress — my oldest-child and perfectionist sides show up and I begin frantically delegating (cough, cough — dictating) tasks to make sure that we complete the task on time. In the midst of this pressure, I have to remind myself that this is just a competition — nobody’s job is on the line and there is no financial investment relying on our recommendation. In our day jobs, we typically have little freedom to innovate. Case competitions provide an opportunity for participants to dream big and come up with out-of-the-box solutions, with minimal concern about resource constraints. By taking opportunities to work the creative side of your brain, you may be more willing to take risks and apply innovative problem-solving skills to tackle ongoing problems in your current job, or perhaps to take an entrepreneurial leap of faith by starting your own venture. Beyond these benefits, case competitions are also great opportunities to network, practice your public speaking skills and build your confidence. I’d encourage every MBA student to participate in a case competition, or — better yet — to encourage your company to sponsor one. Thanks to Jeff Pearlman for organizing this year’s Marriott Case Competition and best of luck to next year’s participants!